The property occupies a highly prominent position on Calthorpe Road the B4217 in the heart of the professional quarter of the Calthorpe Estate and within close proximity to the main Five Ways Island. Calthorpe Road is one way giving access directly from Five Ways Island to Edgbaston and Harborne. Whilst Birmingham City Centre is approx ½ mile to the East of the subject premises and is accessed via the A456 Hagley Road/ Broad Street. 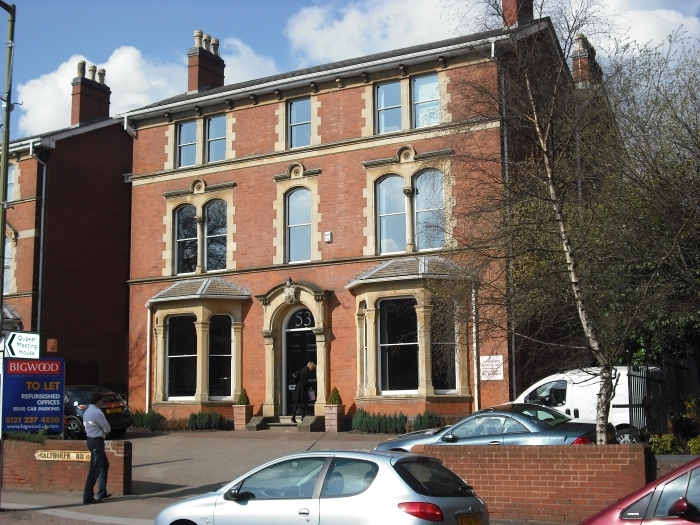 The premises comprise a three storey period property which has been integrated into the Quadrant Court development which was constructed during the 1980s. Internally the property has been recently extensively refurbished to a high standard and comprises a number of offices with a central entrance hall, providing access to all floors with accommodation of painted plaster and papered walls, carpet covered flooring and part suspended ceiling incorporating original details. WC and kitchen facilities are situated on both the ground and first floors. There are two rooms available on the ground floor whilst there are four rooms available on the first floor, and the accom is available on an individual room basis. The premises have the benefit of approx 10 car parking spaces which are situated to the rear of the property. Spaces are available subject to availability at £1000 per square per annum. Available by way of a new lease on an internal repairing and insuring term. The term to be agreed at a rent of £15 per sq ft.